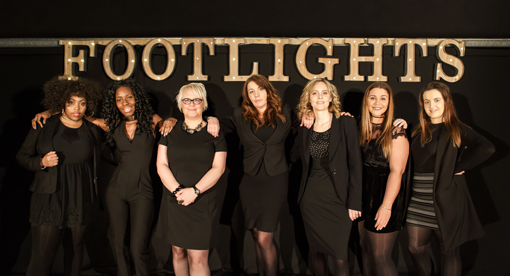 It was in 2005 that our Managing Director, Jo Fisher founded Footlights. After a difficult childhood and coming from a deprived background, Jo left school at 14 years old with no qualifications. The one thing that saved her all those years was her love of literature and the theatre. At aged 22 she finally found her way back into education, and there was no looking back. She always had an entrepreneurial spirit, being Manchester’s first milkwoman in 1988, however once she entered education and went on to train as an actress and later a teacher, Jo combined her two greatest passions in life, business and the theatre. After a few years excelling as a director and teacher she wanted to develop a stage school that didn’t just cater for the elite. In 2009 her first franchise was launched, quite by accident, it was opened by Lindsey Berry a previous mature student of Jo’s. In 2010 she was approached by someone else and in by 2012 Jo had 3 very successful franchisees. It was shortly after this that she decided to halt the franchise business whilst she consolidated what they already had, making the ‘manual’ water tight and expanding in other areas of the business to build the brand. This way, through recognition the brand would get known, she would have a solid business model in which people could invest. In 2016, we made huge leaps starting up another 4 very successful franchises, it was also the year that Footlights moved into its own 4000 square foot building in the heart of Media City, where currently we are building our very own theatre. This is a fantastic hub for training and events and gives all franchisees a great base, whichever part of the country you are from. As a company, we don’t just offer stage school training, although as a franchisee this is what you are investing in. We also produce professional play and theatre for schools. In the past three years we have visiting 100’s of primary schools up and down the country, which is great news for you, as we are building a brand in areas where we currently don’t have any stage schools. We also have our own in house casting agency which has achieved massive success in the past few months and continues to grow, your children from your stage school will also be invited to be part of this. Our Head Office is in Media City. We have our own studio, theatre, training room and facilities. Footlights have been established for 12 years. We have won multiple awards over the years and have 6 successful franchisees in one city. Our training programme is led by our Managing Director. You will be trained not only on our proven system, but also on policies that can only enrich your business knowledge such as Safeguarding and Child Sexual Exploitation. Don’t worry you won’t be investing and be thrown in the deep end, You will have your own mentor who will be with you every step of the way through to launch day and of course, will be available to support you along your journey until you feel ready to let go. We have made all the business mistakes for you and learnt from them. The best part of franchising is that, if you follow the ‘system’ ‘the manual’ you will be a great success. The best bit about franchising we feel, is that you will be running your own business with a massive arm around you, whenever you need it. We have a talented team of very successful franchisees, who are available for a discussion prior to you making any commitment to purchasing a franchise. We will train you in every aspect of opening your own business, from marketing to accounts, dealing with staff, recruitment and pay, safeguarding – to first aid. Be assured we are thorough in our processes and you will never be on your own until you feel absolutely ready. Footlights theatre has 4 revenue streams – Stage schools, Holiday provision, Merchandise and Birthday parties with margins of 30% – 50%. Our network coverage is presently in Greater Manchester in which we have seven franchisees in operation and five company owned units. We have untapped potential in this area still available and we now have the opportunity to go National. We have been franchising for eight years but in the last four have been focusing on building a solid foundation and obtaining a great reputation across this sector. We use leading software to map out territories so franchisees can be confident in their new investment and get a realistic picture of how their business can be successful. You will be investing in a franchise model to run your own stage school and performing arts courses. Initially you will start with opening one school, in your selected territory on Saturday mornings 9.45am-1pm. Once established, you will be developing relationships with your target market, you will be forward thinking in developing your business and your aim will be to maximise on your territory. Once achieving your targets, you will look to open other classes to maximise on your territory and your income. The ideal franchisee will have a hunger for running their own business, an avid interest in the bottom line as well as providing education. You must have a passion for children and their learning; however this is a business model so you must be interested in building a successful business with great profit margin. I don’t have any business experience – is this a problem? Footlights will provide comprehensive advice and help to ensure that you have all the tools you need to run a successful franchise. We will assist you in selection of the most suitable venue; recruiting the best teachers; publicising your school and events; administration through the provision of our System Procedures; and a full A-Z Manual on running your school. We are also able to offer advice on safeguarding, creative issues, marketing and printed material, contracts etc. We support you in every aspect of running and controlling your business. We provide intensive ten day Franchise Training at Footlights Head Office (MediaCityUK), along with the opportunity to meet and shadow other Franchisees. You will also have a mentor who will be with you to launch your school and be a support for you on your journey..
Footlights’ ethos is developing young performers so why not develop new business owners too? We now offer a range of funding options to help you get started. Monthly Royalty Fee: 20% for 3 years, reduced to 10% after 3 years. Monthly Marketing Fee: ZERO for the first 6 months then 1% after the first six months. Monthly Royalty Fee: ZERO for the first six months, then 10% after the first six months. Monthly Marketing Fee: ZERO for the first year – then 1% after the first year. Please complete the online application form and Footlights will contact you. If we both feel that there is potential for a professional relationship, we will give you the option to discuss a franchise opportunity with a current franchisee, there is no obligation at this stage. A Footlights Theatre School franchise offers you the opportunity to run part-time performing arts schools at weekends during the academic year, training children in Drama, Dance and Singing. Most franchisees start with a single school and open further schools once the first is fully subscribed. A full school encompasses 90 pupils in one 3.5 hour session, broken down as 60 main school pupils across three classes and 30 Tiny’s across two classes. For the right person, it is a chance to combine an ambition to have a performing arts school of your own with a significant part-time income. Some franchisees make it a full-time career, extending the classes to evenings during the week. A Footlights Theatre School franchise combines job satisfaction with the capacity to invest for the future. When you franchise with Footlights you are buying into a tried and tested system. The viability of the business is evident and you gain the benefit of our experience and knowledge with none of the stress and administrative headaches associated with setting up a business from scratch. You will receive comprehensive training and ongoing support to help you overcome any problems you may encounter, and benefit from our advertising, marketing, research and development and enhanced purchasing power. Complete the enquiry form and we will contact you. © 2017 Copyright by Footlight Theatre. All rights reserved.